1. Directions: In the question below relationship between different elements is shown in the statements. The statements are followed by two conclusions. (b) Both conclusions I and conclusion II are true. (c) Either conclusion I or conclusion II is true. (d) Neither conclusion I nor conclusion II is true. (e) Only conclusion II is true. 2. Directions: In the question below relationship between different elements is shown in the statements. The statements are followed by two conclusions. 3. Directions: In the question below relationship between different elements is shown in the statements. The statements are followed by two conclusions. 4. Directions: In the following question assuming the given statements to be true, find which of the conclusion among given three conclusions is /are definitely true and then give your answers accordingly. 5. Directions: In the following question assuming the given statements to be true, find which of the conclusion among given three conclusions is /are definitely true and then give your answers accordingly. Directions (6 – 10): In the question below are given two statements followed by three conclusions. You have to take the given two statements to be true even if they seem to be at variance with commonly known facts and then decide which of the given conclusions logically follows from the given statements, disregarding commonly known facts. Give answer. I. Some Mansi are Neepa. II. No Poonam is Neepa. III. All Poonam is Mansi. I. There is a possibility that all drops are books. II. 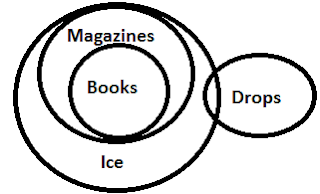 At least some ice are books. No copper is a metal. I. All metals being tins is possibility. II. Some tins are not coppers. (c) Either conclusion I or conclusion II follows. (d) Neither conclusion I nor conclusion II follows. No flower is an olives. I. All olives are babies. II. Some olives are definitely not flowers. I. Some helicopters are buildings. II. Some trees are buildings. III. Some trees are telephones. i. H who is three places away to the right of B is opposite to D.
ii A who is looking towards the center of the table is to the left of F who is to the right of H.
iii. B is to the left of D who is to the right of G.
iv. A and C are not adjacent to each other. C is to the right of E.
v. B who is opposite to F is neither adjacent to G nor C.
11. Which of the following is the correct combination of four persons who are looking towards the center of table? 12. C who is looking _______ the center of the table is to the _______ of H.
13. Person opposite to F is looking _______ from the center of the table and is to the ______ of E.
14. Who is sitting opposite A? (a) G and C are sitting opposite to each other and are facing towards the center of the table. 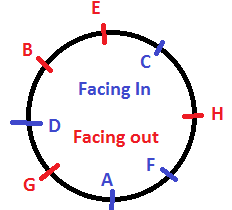 (b) A is sitting opposite to C.
(c) F and B are adjacent to each other. (d) D is facing towards the center of the table. I. Z > G → It may be possible as G = O >/< Z but Z can be less than G as well. II. Z < G → It may be possible as G = O >/< Z but Z can be greater than G as well. Conclusion I and conclusion II are complementary to each other. Hence either conclusion I or conclusion II is true. I. P ≤ R → Not true as it is given that P ≤ D ≥ C ≥ W ≥ X = R therefore there is no definite relation between them. II. D ≥ R → True as it is given that D ≥ C ≥ W ≥ X = R.
I. A ≥ M → Not true as it is given that A >/< V >/< H = M.
II. M < P → It may be possible as it is given that M = U >/< Y > N < P but M can be greater as well. Hence neither conclusion I nor conclusion II is true. Therefore, only conclusion II is true. Therefore, none of the conclusions are true. I. Some Mansi are Neepa → It’s, definitely true. II. 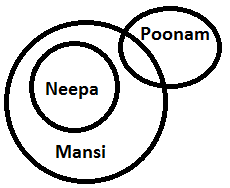 No Poonam is Neepa → It’s possible but not definite, hence false. III. All Poonam is Mansi → It’s possible but not definite, hence false. Hence only conclusion I follows. I. There is a possibility that all drops are books → Clearly follows, hence true. II. At least some ices are books → Clearly follows, hence true. Hence, both conclusion I and II follow. I. All metals being tins is possibility → Clearly doesn’t follow, hence false. II. Some tins are not coppers → Clearly doesn’t follow, hence false. Hence, neither of the conclusions follows. I. 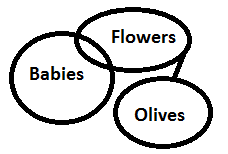 All olives are babies: It is possible but not definite. II. Some olives are definitely not flowers: It is true. Hence, only II statement follows. I. Some helicopters are buildings → it’s possible but not definite, hence false. II. Some trees are buildings → it’s possible but not definite, hence false. III. Some trees are telephones → it’s possible but not definite, hence false. IV. No tree is buildings → it’s possible but not definite, hence false. Here conclusion II and IV form complementary pair. Thus either conclusion II or IV follows.